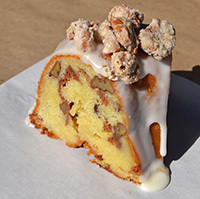 Chris Flores, once a baker at West Egg and Bakeshop and executive pastry chef at Nikolai’s Roof, has been busy seeding his pastries around the city. Proprietor and pastry chef at the four-month-old Ratio Bakeshop, Flores makes everything from scones and macaroons to brownies and cheesecakes. He currently works out of a shared kitchen in Decatur, where he prepares sweet treats for MetroFresh, Honey Bubble, and Savi Urban Market, among others. But in the next six months he plans to open a retail location in either Decatur, Midtown, or Grant Park. The retail location will serve coffee and pastries and eventually bread. But for now, Flores is busy putting the finishing touches on his fall menu. Currently, he says he sells a lot of cheesecakes, blondies, chocolate fudge brownies, and berry shortbread bars. He has a crème fraiche cake with white chocolate buttercream frosting and strawberry-lemon filling that’s popular, too. Come September, Flores aims to shift the focus to sweet potato shortbread bars with apple butter, pumpkin bars, brown butter pear pound cake, a brown sugar cake with caramel frosting, and a chocolate stout cake with Guinness and chocolate buttercream. To that end, Flores has developed a line of gluten-free goods that he sells at the Sweet Auburn Curb Market, among other locales. These desserts include chocolate-peanut butter cookies, flourless chocolate truffle cake, peanut butter-chocolate meringues, and pralines.